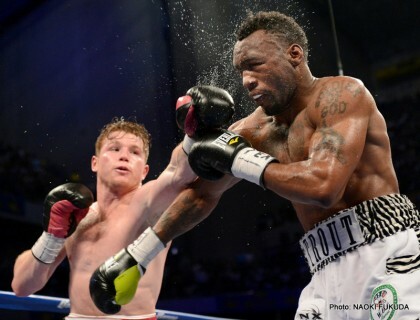 The highly anticipated junior middleweight unification showdown between WBC champion Saul Alvarez and WBA titlist Austin ‘No Doubt’ Trout started on a dramatic note before the action even got underway. The atmosphere at the Alamodome was simply electrifying. The high energy and intensity that exuded during the build-up to the opening bell was so powerful that it could even be felt by the television viewing audience, and it was contagious. Although this was not a hugely publicized contest that created massive appeal among casual fans, the entire event still possessed a magical mainstream vibe that almost helped make it seem far larger in its actual scope. The stage seemed set for something special. The fight itself was a pretty good one, too. It was a classic competitive clash of contrasting styles, making close rounds very difficult to score. Trout was looking to work behind an active jab and keep Canelo at the end of it to maintain optimal range. Alvarez sought to avoid incoming fire and quietly sneak his way in to a more favorable distance where his explosive punching power could be better utilized. Both boxers had success at various points, with the nature of their styles dictating that Trout would control the action for longer stretches, but Alvarez’s superior pop made his moments more memorable. It was a close fight that became a chess match of sorts, with tactical maneuvering, several momentum shifts, adjustments and counter adjustments, a knockdown (scored by Alvarez in the seventh), and a fine overall display of skills and natural talent. Going into the twelfth and final round, having the fight scored even at 104 apiece was certainly in the realm of reason. It was a competitive encounter with enough close rounds that the outcome was up in the air—or at least it should have been! Now that is not to say that those observers who had one fighter or another up a couple of points were off the mark, but it was obviously still a close contest. Typically speaking, all of the pieces were in place so that this should have made for an action-packed final stanza that saw each man digging deep and giving his all to help secure victory with the verdict still in question. Only instead, for this particular fight, the final outcome was never truly in question. As a result of another open scoring experiment, it was already known that Canelo had huge leads on the official cards after eight rounds and that Trout would pretty much need a knockout to win. As such, Alvarez had no reason to take unnecessary risks in the twelfth and was able to safely coast, potentially depriving viewers of a punctuating powerhouse finish. Open scoring experiments usually leave fans with mixed feelings. On one hand, Trout knew that he needed a knockout to win. To his credit, Trout was trying to make something happen and taking more chances throughout the final third of the fight. On the flipside, going into the final round Canelo knew all he had to do was be on his feet at the final bell and victory was his. Dutifully and wisely, Alvarez did not engage with a sense of necessity he may have otherwise felt had he not known the official tallies after eight. Now if Trout had actually gone on to score the knockout then we would be singing an entirely different tune right now and showering this experiment with volumes of high praise. That would have brilliantly illustrated that open scoring does create a sense of urgency for the fighter needing it and that it can affect the outcome by shaping incentive for the losing boxer to take necessary risks. But in this particular instance, however, it instead forced Canelo into a situation where the smart move was to lay back and refrain from taking any chances at all. In that light, both the fans and combatants themselves were perhaps cheated out of a dazzling grand finale that would have capped off a bout that had begun with so much fire and electricity. Instead the ending we got was rather lackluster and anticlimactic, especially considering the high energy and tension immediately preceding the actual action during the opening ceremonials. Then again perhaps it is misdirected to place blame on the experiment, because one might also convincingly argue that if two of the three judges’ cards were better reflections of the actual action that took place inside the ring, that the open scoring experiment could have inspired both fighters and enhanced their performances likewise. And then of course, there are also no guarantees that the twelfth round would have been anything special, even without open scoring and regardless of whom the judges were. Even still, it is definitely interesting to ponder how things may have turned out and perhaps unfolded differently had the open scoring experiment been attached to some different fight that evening. You are here: Home / Boxing News / Open Scoring Experiment: Did it Ruin the Alvarez-Trout Finish?